Ohio State will begin spring football practice on March 8th. Heading into the 2016 college football season, Ohio State will have 44 players on its roster designated as either a redshirt freshman (21 of the 25 players signed in February 2015), or a true freshman. For a roster that can have only 85 scholarship players, Ohio State will have around 52% of its roster with no playing time experience. As former Ohio State Head Coach John Cooper used to say, “If a dog is going to bite you, it will bite you as a pup.”. Players Lost – Joshua Perry, Darron Lee, Cam Williams, and Kyle Berger. Perry exhausted his eligibility, and was a solid, dependable two year starter at outside linebacker. Lee was also a two year starter at outside linebacker, and declared early for the 2016 NFL Draft, with two years of eligibility remaining as a redshirt sophomore. Williams exhausted his eligibility as a four year contributor, primarily upon special teams duty. Berger was forced to give up football this winter, due to a recurring knee injury that never fully recovered from his high school career. Returning Players/Incoming Players – Jerome Baker (Sophomore), Dante Booker (Junior), Joe Burger (Senior), Nick Conner (Redshirt Freshman), Craig Fada (Senior), Justin Hilliard (Redshirt Freshman), Raekwon McMillan (Junior), Chris Worley (Redshirt Junior), Tuf Borland (Freshman). 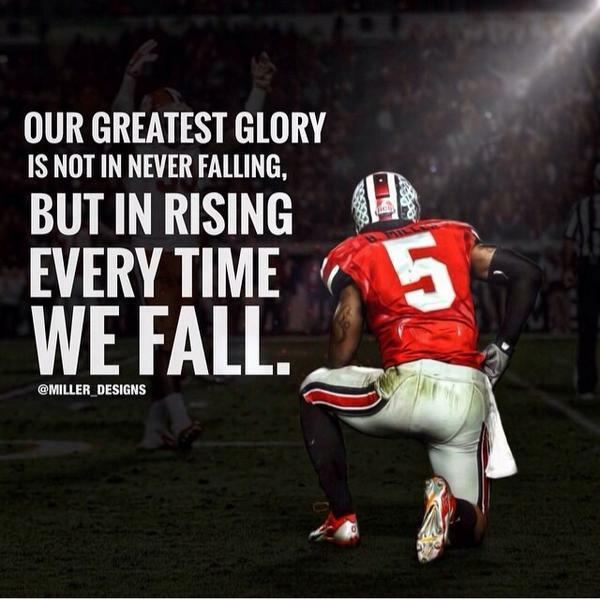 · Raekwon McMillan is a lock to start at middle linebacker, barring unforeseen injury. If McMillan was unable to play, this position group would rank higher in my estimated concerns. McMillan has already been designated a captain by Ohio State Head Coach Urban Meyer. McMillan will be strongly depended upon by the coaching staff to steady this position group during the initial phases of the 2016 season. · Dante Booker seems to be the leading candidate to replace Joshua Perry at the Will linebacker position. Booker has played primarily on special teams in 2014 and 2015, and now is his opportunity to rise up and seize the job at Will linebacker. · The battle to watch seems to be at the Sam linebacker spot between rising sophomore Jerome Baker and rising redshirt junior Chris Worley. Baker seems to be the favorite, but fans would be wise to remember that Worley gave Darron Lee a run for the job two seasons ago, and will not want to remain on the bench. · Justin Hilliard and Nick Conner were among the highly-touted 2015 recruiting class. Hilliard and Conner both redshirted due to injuries. Will either be able to make a move, with two positions open at linebacker? · Joe Burger and Craig Fada were both awarded scholarships for the spring by Coach Meyer. Will either be able to move beyond special teams duty this spring? · Tuf Borland was an early enrollee this January. Can Borland show enough this spring to warrant a look for playing time this fall? These questions, among others, will be on my mind once Ohio State spring practice begins March 8th. Congratulations to the 2015 Ohio State Buckeyes for a thorough and dominating performance against That Team Up North. Heading into this game against their rival, with so many doubts about the team’s collective psyche, it would be fair to say that the Buckeyes were facing their moment of truth in Michigan Stadium. Ohio State Head Coach Urban Meyer, the coaching staff, and the players all truly rose to the occasion in the 42-13 victory. Also, congratulations to all of the players who were honored by inclusion on The B1G conference teams. Defensive lineman Joey Bosa, linebackers Raekwon McMillan and Joshua Perry, and safety Vonn Bell were named first team All-B1G defense, while defensive tackle Adolphus Washington, cornerback Eli Apple, linebacker Darron Lee, and punter Cameron Johnston were named to the second team. Running back Ezekiel Elliott, offensive tackle Taylor Decker, and guard Pat Elflein were named first-team All-B1G offense. Wide receiver Michael Thomas, center Jacoby Boren, and guard Billy Price were named to the third team. Congratulations to Taylor Decker for being named the B1G offensive lineman of the year, Joey Bosa for being named the B1G defensive lineman of the year, and to Ezekiel Elliott for being named both the B1G running back of the year, as well as the B1G offensive player of the year. Above all, congratulations to the Buckeyes for winning their fourth straight pair of Gold Pants. Back to the main point, and that is savoring the dominant victory over That Team Up North. After Ohio State won over That Team Up North, it got me thinking ~ where does this victory rank, when I think of the wins over That Team Up North in Ann Arbor? 4. 1987 Ohio State 23, That Team Up North 20: Perhaps I am going too far back into the archives for some of the readers here, but the way the Buckeyes were able to win the final game for fired Ohio State Head Coach Earle Bruce is very memorable to me. Watch the clip below, and tell me Coach Bruce wasn’t fired up for this one. And who knew how dreadful the next thirteen years against That Team Up North were going to be?!? 3. 2015 Ohio State 42, That Team Up North 13: The most dominant performance by the Buckeyes over That Team Up North in Ann Arbor with the 29 point victory since Ohio State won 50-20 in 1961. Ohio State Head Coach Woody Hayes had an assistant on his staff that year – some fellow named Bo Schembechler. 2. 2005 Ohio State 25, That Team Up North 21: Yes, I am still mesmerized by Troy Smith’s poise and footwork with only seconds remaining. 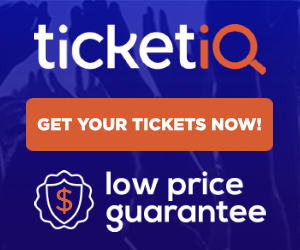 As former Ohio State Head Coach Jim Tressel said about Troy Smith, “There will be a lot of No. 10 jerseys and a lot of kids on Thanksgiving weekend trying to make those moves in a pile of leaves…”. Yes, I still get excited watching Anthony Gonzalez make a clutch catch to put Ohio State into scoring position. Yes, Antonio Pittman should get more credit for the winning touchdown run that sealed the win. Here is why I rank this game so high on my list ~ Ohio State was down 21-12 midway through the fourth quarter, and the Buckeyes rallied to victory in this thriller. 1. 2001 Ohio State 26, That Team Up North 20: “You will be proud of our young people in the classroom, in the community, and most especially, in 310 days in Ann Arbor, Michigan, on the football field…”. After so many disappointing losses in Ann Arbor from 1989-1999, I will forever savor this one. To top it off, Ohio State knocked That Team Up North from The Rose Bowl by virtue of this defeat, so it was like pouring salt into the wound. There is an old saying about “Beauty is in the eye of the beholder”. When I behold this list, and think of the dominance Ohio State has had over That Team Up North these past several years, I truly believe I am looking at a thing of beauty. On March 10th, Ohio State began spring practice and will have fifteen spring football practices before the conclusion of spring practice on April 18th in Ohio Stadium. Over the next few weeks, I will rank the top ten questions facing Ohio State Head Coach Urban Meyer and his coaching staff as the Buckeyes retake the football field after concluding the 2014 season as the national champions. These articles will be submitted from areas of lowest concern to highest concern. While Ohio State returns the overwhelming majority of its 2014 team, and welcomes in a highly-touted recruiting class, it will be important for Coach Meyer to convey to his team that complacency within the player ranks could derail any hopes of the Buckeyes repeating as national champions in 2015. Similar to what I wrote about with regards to the running backs and H-Back positions for Ohio State, it seems challenging to call this area of the football team a concern. Darron Lee emerged as one of the most dynamic linebackers in the country, with timely plays against Navy, Maryland, Alabama, and Oregon, among others. Lee has established himself as “exhibit A” of not overemphasizing recruiting rankings, as Lee was a three-star recruit who earned his scholarship with tenacity and determination at Ohio State’s summer recruiting camp. Raekwon McMillan played well and often at the middle linebacker spot, alongside former Buckeye teammate Curtis Grant. McMillan was considered one of the crown jewels of the 2014 recruiting class, and played up to his billing. Lastly, rising senior Joshua Perry has quietly and consistently developed into a steadying presence on the Ohio State defense over his previous three seasons; Perry should emerge as an Ohio State captain for the 2015 season. Ohio State Head Coach Urban Meyer stated on National Signing Day 2015 that he is “really excited about” the linebacker position, adding, ” I think that Luke Fickell has really done a very, very good job the last three years of building back up to the Ohio State standards…you’re starting seeing these athletes coming up on all special teams. There was a time a couple of years ago the linebackers weren’t involved in the kicking game. It was because for whatever reason they’re not. Now they’re all over the place…”. In addition, there will be two more linebackers joining the position group in June, with Justin Hilliard and Jerome Baker both signing with Ohio State. As Coach Meyer said, Coach Fickell has replenished the linebacker position very well, and the results were evident during the 2014 national championship season. If I had to summarize my concerns over this position group, it would be in the simple fact that the linebackers are very talented, but also very young. With the exceptions of Perry and Camren Williams, there are no upperclassmen. Injuries ended the careers of Trey Johnson and Devan Bogard, and the backup positions have seen minimal game experience outside of special teams duty. Of course, former Ohio State Head Coach John Cooper used to say, “If a dog is going to bite, he’s going to bite as a pup.”. I would prefer Ohio State’s coaches let the young linebackers take their bites out on the opposition, especially early in the season, to help provide that necessary maturity and experience emerge. Quarterbacks: A solid ‘B’, but could rise to an ‘A’ by the conclusion of the season. Redshirt freshman quarterback J.T. Barrett was unenviably thrown into the starting position when projected starter Braxton Miller’s shoulder injury was season-ending. Barrett struggled immensely against Virginia Tech in week two, but has had three straight sterling performances versus Kent State, Cincinnati, and Maryland. Will Barrett be able to continue his strong play as Ohio State continues B1G competition for the remainder of the season? Cardale Jones has played sparingly as a backup so far this season. Running Backs: B+. Ezekiel Elliott has seized the starting position, and looks to be in the Carlos Hyde mold of being able to wear an opposing defense down. Senior Rod Smith figures to be a complimentary player for the remainder of his Ohio State career. Coach Meyer has praised Bri’onte Dunn as being worthy of more playing time. True freshman Curtis Samuel is presently battling an ankle injury. The coaching staff seems to have concluded that Dontre Wilson is best used as a perimeter player running the ball; the same for Jalin Marshall. Warren Ball has battled injuries this season, and gets little playing time. Wide Receivers: B-. This position group is kind of a mixed bag. The talent is there, but has not established itself on a consistent basis. Michael Thomas, Corey Smith, Evan Spencer, Devin Smith, Jalin Marshall, Dontre Wilson – all play, yet none have seized the starting positions with a commanding performance. Senior TE Jeff Heuerman has battled injuries, but may have turned the corner. Nick Vannett has also played capably this season. Offensive Line: B+. Considering where this group started, how the players were being mixed in and out of the lineup, with inconsistent results…This offensive line may be the most pleasant surprise on the team. Losing four starters, and moving the only returning starter with Taylor Decker to left tackle, meant the offensive line was completely unsettled and incohesive. The offensive line is only going to get better by the season’s end. Senior Darryl Baldwin has been singled out by Coach Meyer for his continuing development at right tackle. Jacoby Boren has taken a firm grasp of the starting center position. Defensive Line: B-. Joey Bosa is staring down a first team All-American selection after this season. The suspension of Noah Spence has hurt Ohio State’s pass rush. Michael Bennett, Adolphus Washington, and the combo of Steve Miller/Rashad Frazier have played well, but have not been nearly as dominant as expected by the fan base. An opportunity to dominate the opposition looms when the Buckeyes travel to Penn State on October 25th. Linebackers: B. True freshman Raekwon McMillan may have clinched the starting middle linebacker position by the season’s end. Darron Lee was the player of the game in the season opener versus Navy. Joshua Perry has been relatively quiet on the playmaking front. Will this group be able to step up with physical rushing opponents such as Michigan State and Minnesota on the horizon? Secondary: C. A true work in progress. While improving, this is the weak area of the team. How much of it is scheme, and how much of it is personnel? Eli Apple may have turned a corner, no pun intended, with his performance at Maryland last weekend. This position group may improve with better performances at Penn State and Indiana. Special Teams Units: B+. True freshman Sean Nuernberger has been better after two missed field goals against Virginia Tech in the second game of the season. Will Nuernberger be able to come through if needed to make a game winner? Cameron Johnston is quietly reliable at the punting position. Coach Meyer stresses the importance of special teams as being a gateway to playing time, and the coverage units have been solid. Conclusion: If 2014 Ohio State football were a stock, this would be a solid buy acquisition. Ohio State should be 7-1 heading up to East Lansing, MI, for what should be a B1G East Division elimination game. “Should be” does not mean “will be”, especially after Virginia Tech came into Ohio Stadium and defeated the Buckeyes in week two of the season. If Ohio State can defeat a very good Michigan State team in front of a national television audience, it is not far-fetched for Ohio State to possibly emerge as a playoff participant. A surefire way to make a one game losing streak into a two game losing streak is to keep looking back at the game your team lost. While disappointed with Ohio State’s loss to Virginia Tech last weekend, the Buckeyes need to regroup and refocus with the Kent State Golden Flashes coming into Ohio Stadium on September 13th. 2. Play The Starters For At Least Three Quarters: Developing chemistry and cohesiveness with the offensive line, the linebackers, the secondary, etc., can only happen through repetition. By keeping the starters in through at least three quarters, Ohio State will be able to work through a lot of the kinks that have been visible through the first two games of the 2014 season. Once the third quarter concludes, I would hope Ohio State would liberally play as many backups as possible, especially with backup quarterback Cardale Jones only one snap away from taking over the starting quarterback position. 3. Fix The Special Teams Units: For the first two games of the 2014 season, Ohio State’s special teams have been consistently inconsistent. Senior PK Kyle Clinton has twice failed to keep the ball inbounds on kickoffs. Freshman PK Sean Nuernberger missed two field goals versus Virginia Tech. Sophomore P Cameron Johnston had a 24 yard punt versus Virginia Tech. And the kickoff coverage team made costly coverage and tackling errors. While Coach Meyer would always prefer to score touchdowns versus field goals, focusing upon Nuernberger’s psyche would not be a bad thing – I can recall how Ohio State legendary PK Mike Nugent struggled as a true freshman in 2001, and it took Nugent some time to work his way out of his issues. Fortunately for Ohio State fans, Nugent was a clutch performer for Ohio State’s 2002 national championship team. While I would prefer for Ohio State to pin its opponents deep in their own territory, I would gladly sacrifice this option if it meant opponents were not starting on their own 35 yard line. I would hope the coaching staff has worked with Clinton on his kickoffs, as this has impacted Ohio State twice this season already. As for the kickoff units, I recall how Coach Tressel used his 2002 linebacker recruits (Bobby Carpenter, A.J. Hawk, Mike D’Andrea) on kickoff coverage. Could Coach Meyer do the same with freshmen such as Raekwon McMillan, Dante Booker, or Sam Hubbard? It is important for Ohio State coaches, players, and fans to get over the loss to Virginia Tech, and focus upon the remainder of the season. The game versus Kent State is the first opportunity to refocus and concentrate upon the message in the image below. Go Bucks! 5. Defensive Back: One of the biggest changes, after spring practice. Previously ranked as the third most concerning area, I would lower this area after spring practice. Even though there are two open positions at cornerback and safety, my reasoning for feeling better about the defensive backfield lies in the more aggressive approach that was evident during the spring game. Instead of playing off the wide receivers, Ohio State’s defensive backs were pressing right from the line of scrimmage. Throw in the dominant Ohio State defensive line that figures to continually pressure opposing quarterbacks, and it would seem likely that the defensive backs will be in a great position to excel, despite their inexperience. 4. Wide Receiver: Another position group that moved, and this actually increased in concern following spring practice. Talent is on the roster, yet it was evident in the following comments by Ohio State Head Coach Urban Meyer following the spring game where his thoughts were about his wide receivers after the spring game ~ “We’re not where we need to be. I think we’re better that we were two years ago, and I’m hoping we’re a better notch than we were last year. We got a ways to go…Receiver, I can’t name you one that’s going to start. Which is concerning, but it’s comforting to know I can name about six that have the ability. Those would be Devin Smith, Johnnie Dixon, Michael Thomas, I think Jalin Marshall, before he got hurt he was having a great spring, Dontre Wilson and Evan Spencer; we have some depth there.”. Keep an eye and ear open for news about this position group over the summer workouts and fall camp. 3. Linebacker: A position group that has improved since before the spring practices, yet remains in the same area of concern. While rising junior Joshua Perry has earned a starting outside linebacker position, battles for the other two spots remain between rising senior Curtis Grant and true freshman Raekwon McMillan for the middle linebacker job, and Darron Lee and Chris Worley are both in the mix at the walkout linebacker spot. Considering Ohio State opens up the 2014 season at Navy, a triple option attack, it will be crucial for Ohio State’s linebackers to play disciplined; will that be possible with such inexperience at this position? 2. Backup Quarterback: Another position group that has been elevated since spring practice began, and it truly has less to do with the spring game than the reality of the situation. Rising redshirt sophomore Cardale Jones has emerged as the top backup quarterback, with rising redshirt freshman J.T. Barrett third string. While Coach Meyer seemed pleased with Jones’ development over the course of the spring practices, it must be asked – is Jones truly ready to lead Ohio State if rising senior Braxton Miller is injured this upcoming season? 1. Offensive Line: The biggest concern I had heading into spring practice, and nothing has changed since spring football concluded. In the words of Coach Meyer, “Offensive line, we’ve got to really go, we gotta really go from here. I saw Jamarco Jones, Demetrius Knox is coming in, Brady Taylor. Those are three bodies that are going to be coming in in June and I look them right in the eye and said “You’re not red shirting; you’re playing,” and that’s hard for an offensive lineman, so we’re gonna — that’s an area that we have got to get back to where we — maybe not where we were, but close…On offense you got Pat Elflein and our left tackle, Taylor Decker, and everyone else is wide open, no other spots taken.”. My first thoughts, as I read those comments? Be grateful that Ohio State was able to retain offensive line coach Ed Warriner. Thomas Edison once stated, “Opportunity is missed by most people because it is dressed in overalls and looks like work.”. Ohio State fans can rest easy knowing that the Ohio State coaching staff and players will seize these opportunities to work over the coming summer months. Attending the Ohio State spring game has always been one of my favorite spring time events. The very first spring game I attended was in 1996, eagerly anticipating how the newly-signed quarterback Mark Garcia would do in his Ohio State debut, as he battled Stanley Jackson for the starting quarterback position. Little did anyone know a third quarterback by the name of Joe Germaine would outperform both quarterbacks in the spring game, giving fans in attendance an early glimpse at one of the best quarterbacks in Ohio State football history. Another fond memory was the 2003 spring game. Not only was Ohio State basking in the glory of the 2002 national championship, but fans were treated to an aerial duel between Justin Zwick and Troy Smith. It was the unofficial beginning of the quarterback battle for the 2004 starting job. @smsommers84 Taking my wife and kids. Can't wait. Ohio State head coach Urban Meyer has already stated that true freshmen Curtis Samuel and Johnnie Dixon figure prominently in Ohio State’s upcoming season; the spring game will give fans that first look at both as Buckeyes. Freshman linebacker Raekwon McMillan and freshman placekicker Sean Nuernberger will also be counted upon this fall; I am anxious to see how both perform for what should be a pretty decent crowd. The player I am most anxious to see? Linebacker Darron Lee, who has been starting all spring. Lee has been consistently cited by Coach Meyer for his aggressiveness and intensity all spring. Considering the level of disappointment that Coach Meyer and the fans had of the 2013 linebackers, watching Lee’s performance will be foremost for me at the spring game. A close second? Cornerback Eli Apple. Apple redshirted in 2013, but has recently had his black stripe removed, symbolizing that he is now a player that will be relied upon in game situations. Like the linebackers, the 2013 secondary left much to be desired. Apple and Gareon Conley have been playing well this spring, and will be challenging for playing time this season. Yes, youth will be served during the spring game. Youth may also be served this coming season. From the day that Urban Meyer was hired as the head coach of The Ohio State University he hit the recruiting trail hard and fast and never looked back. He has landed some of top recruits in the nation and the top recruiting classes in the nation the last 2 years. The 2014 class may be the best yet of the 3 under his belt and with the commitment today of the nations top Linebacker he also added the most important part of the class. The needs for the 2014 class are evident Offensive Lineman and Linebackers are top priorities and Coach Meyer already has landed some top talent at both positions but there was always one LB he coveted and fought hard to land and those efforts payed off fully today in landing the 18th member of the 2014 class. Raekwon McMillan committed to play for The Ohio State University Buckeyes live on NBCsports today. 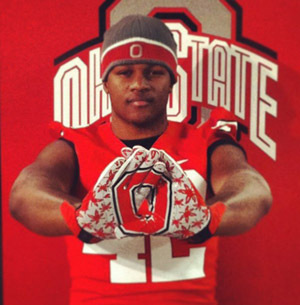 Raekwon McMillan is a 6’2″ 245 lbs 5 star Linebacker from Hinesville, Georgia. Raekwon is a game changing recruit. He is a big boy who hits extremely hard and has speed you dont expect from someone his size. His greatest skill though is his ability to see the whole field and get to the ball. He has those intangibles that a middle LB needs to be great. He will come in right away and fight for playing time at a position of great need. 247Sports ranks him a 5 star and the 16th best recruit in the country. Rivals ranks him a 5 star and the 19th best recruit in the country. ESPN ranks him a 5 star and the 12th best recruit in the country. Scout Ranks him a 4 star and the 5th best MLB in the country. You can follow Raekwon McMillan on Twitter by clicking @Kwon_daTRUTH.